We have a popular article here on MiniPCDB about the best mini PC/TV box chipsets currently available : the Amlogic S912, Realtek RTD1295 and HiSilicon Hi3798C V200. 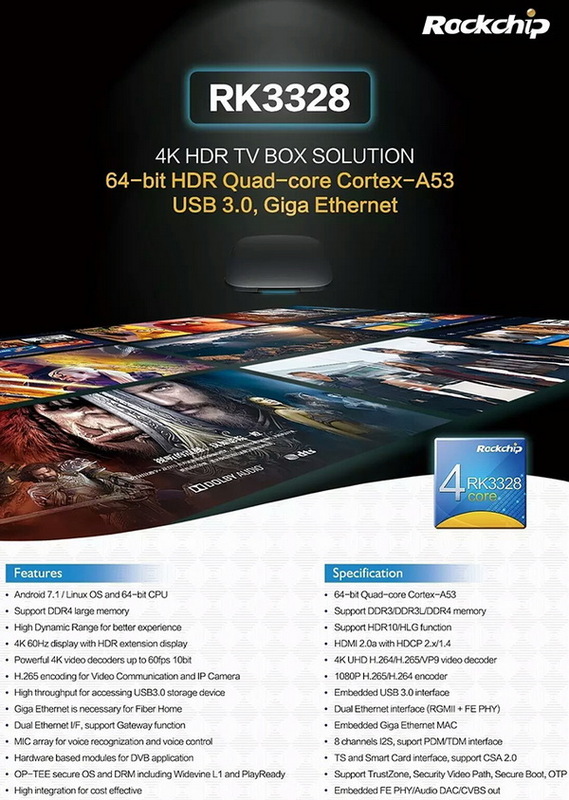 Notice a chipset manufacturer known for their SoC's for TV boxes that is missing from the list? Rockchip revealed some of their plans for 2017 at CES 2017 this week, plans that include Rockchip RV1108 "visual processing platform", which could power the next generation drones, dashcams and sports cameras everywhere. They also did show off two of the SoC's we'll talk about here on MiniPCDB due to the fact that there will be included in this year's Mini PC's - the Rockchip RK3399, a hexa-core SoC which should appear around May on devices like Remix IO+. And there's also Rockchip RK3328, which should come out later this year and should spice up things a bot with it's 4K 60fps / 10bit support, "large capacity" DDR4 and Android 7.1. This post will be edited through 2017, as soon as we get to test some devices using the new SoC's.